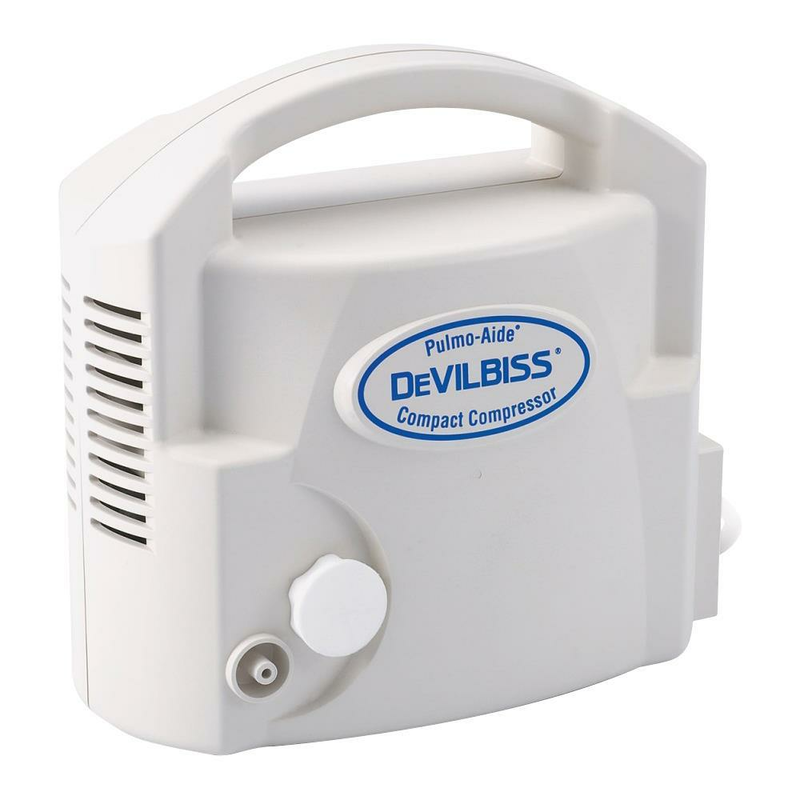 DeVilbiss Pulmo-Aide Compact Compressor Nebulizer System converts the medication into a high-quality mist of fine particles that penetrates deep into the lungs. It is the perfect solution for patients seeking quality and effective treatment from a compressor with small footprint design. 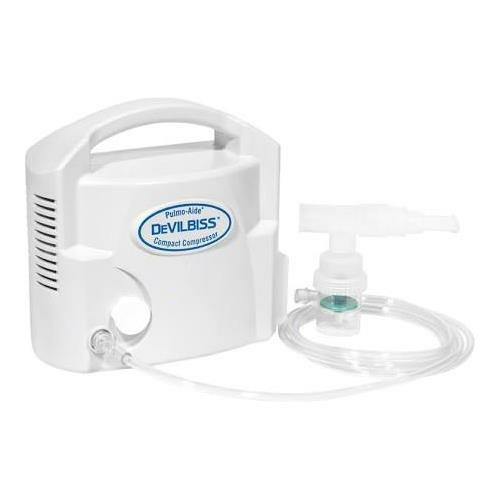 How to Use Devilbiss Nebulizer? Start by placing the Devilbiss Compact Compressor on a smooth, level surface so that the controls can be easily reached when seated. Do not block the air openings of the compressor or place it on a soft surface, such as bed, couch or patient lap where the air openings may be blocked. Make sure the power switch is in the "Off" position. Power cord is then unwrapped and plugged into an appropriate wall outlet. Plug Devilbiss 3655D Pulmo Aide Machine into a grounded wall outlet. Note: Pulmo-Aide Compact Compressor Nebulizer System must be operated on the specified power source to avoid risk of electric shock and damage to the compressor. One end of nebulizer tubing is then connected to the compressor air-outlet connector. Note: During high-humidity weather conditions, condensation (water build up) can occur in the nebulizer tubing. Assemble clean nebulizer and add prescribed medication. Assemble mouthpiece, corrugated tubing, t-piece (if applicable) and insert into the top of the nebulizer cap. When you are using an aerosol mask, insert the bottom of the mask into the top of the nebulizer cap directly. Attach tubing to nebulizer air-inlet connector. Press the power switch "On" to start the Pulmo Aide Compact Compressor. Begin treatment by placing the mouthpiece between teeth. Keeping your mouth closed, inhale slowly and deeply through mouth as aerosol begins to flow, then exhale slowly through the mouthpiece. If treatment needs to be interrupted, simply press power switch "Off". Note: Your physician may recommend a specific breathing pattern during treatment. If so, follow his/her recommendations. If an aerosol mask is used, place the mask over mouth and nose. As aerosol begins to flow, inhale deeply and slowly through mouth, then exhale slowly. When treatment is complete, turn unit off by pressing the power switch to the "Off" position. Unplug the unit from the wall power outlet. With power switch in the "Off" position, unplug power cord from wall outlet. Disconnect the tubing and set it aside. Disassemble mouthpiece or mask from cap. You are now supposed to open the nebulizer by turning cap counter-clockwise and removing baffle. Wash all items, except tubing, in a warm water/dishwashing detergent solution. Then rinse them under warm water for about 30 seconds to remove detergent residue. Allow to air dry. For reusable nebulizer only, clean daily in dishwasher using top shelf. Wipe the compressor cabinet from outside with a clean damp cloth every few days to keep dust-free. Note: Do not submerge in water; doing so will result in compressor damage. Five Year Warranty: DeVilbiss Compressor models are warranted to be free from defective workmanship and material for a period of five years from the date of purchase. Any defective parts will be repaired or replaced at DeVilbiss option if the unit has not been tampered with or used improperly during that period. Make certain that any malfunction is not due to inadequate cleaning or failure to follow the instructions. I need Air Inlet Filters, does your website sell it? After how long am I supposed to clean it? Cleaning of the Pulmo-Aide Nebulizer is recommended after each aerosol treatment and its disinfection is recommended once a day to prevent the possible risk of infection from contaminated medication. I have my unit connected but it does not seem to be using the medication. The amount stays the same after 4-5 minutes It has been at least a year since I have used it and I am stumpted? Thank you for reaching out to us. The product has a limited warranty of 5 years. You can contact the manufacture, they will help you resolve your query. I have the 3655D model...are u supposed to remove the white filter knob when using? No- that is the filter and should be in the unit when utilizing it. This filter should also be replaced when it becomes discolored. Hope that helps. Thank you for reaching out to us. Usually a vial take 15 – 20 minutes for a treatment. Our units are to be run 30 minutes on and 30 minutes off. It would probably be best to do one treatment and wait 30 minutes and do the other. Does it come with tubing, mouthpiece etc??? this is to Customer Care: what item number on your site is the replacement kit that can be bought? The item# of the replacement kit is 3655D-621. Thank you for reaching out to us. When you purchase the 3655D it does come ready to use with (1) disposable nebulizer kit, which is the tubing , medicine cup and mouth-piece. This kit should be replaced at least every 2-4 weeks.